As we currently witness in the forefront of worldwide daily news, there’s no hiding from countries’ hideous reaction to ‘other’. Teesri Duniya Theatre, in collaboration with the Armenian Genocide Centennial Committee of Canada (AGCCC), is honoured to present Rahul Varma’s State of Denial from October 8-25 at Segal Centre Studio. This moving and unsettling play, directed by Liz Valdez, highlights the urgent need to counter denials of gendered violence, ethnic cleansing and racial rivalry. Continuing their mandate to encourage dialogue, the company will hold a talkback with invited guests after each matinee performance. 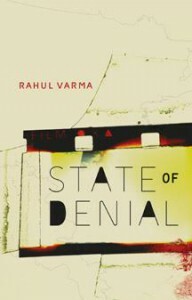 Set in contemporary Canada and Turkey of 1915, State of Denial links the Turkish-denied Armenian genocide of 1915 with the 1995 genocide in Rwanda, connecting them through the Canadian diaspora experience. When Odette, a Rwandan-born Canadian filmmaker, travels to Turkey to investigate stories of genocide and hidden identity, she interviews Sahana, an elderly and respected Muslim woman who has devoted her life to assisting Armenian survivors. On her deathbed, Sahana confesses a chilling secret that challenges a long-standing state of denial that Odette promises to make public at any personal cost. Making up the talented, multi-ethnic cast is Susan Bain, Victoria Barkoff, Liana Bdéwi, Jimmy Blais, Michaela Di Cesare, Eric Hausknost, Saro Saroyan and Warona Setshwaelo. The fictional State of Denial is derived from multiple true stories from the research project, Life Stories of Montrealers Displaced by War, Genocide and other Human Rights Violations housed at Concordia University. Playwright Rahul Varma affirms, “The stories of elsewhere are Canadian stories affecting all citizens. They go beyond biography and facts, revealing truth while instigating further inquiry. My aim is to address global issues locally.” An earlier workshop production of the piece was performed in 2012. There will be a talkback with invited guests after each matinee performance. ← Wanna get involved with this cool participatory project in advance of the federal election?